spring sponsors and a giveaway! Our spring events in Vermont were sponsored by several friends and featured artists. Each gift was a lovely gesture of support and generosity! Local potter, Jessica Putnam-Phillips from Battenkill Pottery created a beautiful tea leaf piece for each guest. Perfect for a tea bag or spoon, it is handmade in Vermont in her pottery. Mary Engelbreit gifted everyone with her new "Vacation Memories" coffee mugs in gift boxes from Cape Shore. Soooooo cute! Dimensions sent us the new Love Life sampler kits designed by our friend, Pam Garrison! 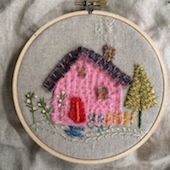 Our featured guest artist, Rebecca Sower made gorgeous stitch kits for each of her students. Handmade project keepers were all the ooh and aah when she took them out for her class! These lovelies are included in our giveaway goodie bag. Please leave a comment on this post to be entered in the drawing July 20! While we visited Tammy at her farm, her friend Matt shared his handmade rolling pins with us. He is offering them for sale on his facebook page Hiz and Herz. And of course, Tammy has beautiful fiber farm goods for sale though her etsy shop. Thank you to everyone who contributed to our weekends! Please visit their sites and shops. Not too early to be thinking about the holidays! Still time to sign up for the fall getaway to come in September. The best time of year in Vermont and New England! September 17-20 we will be quilting with Kaari using her fabric line from Moda. When Jenn comes September 24-27, we are painting little wood houses. And each weekend, we are also making shadowboxes from upcycled cigar boxes. Looks like another delightful pair of weekends ahead! And don't forget to enter the drawing!